Kick! Punch! It’s all in the grind. VGD lays a score on EA Tiburon’s strapping grappler. PS3 and Xbox 360 versions tested. Picture the scene. A pair of fine, well-rendered and animated young men, stark naked but for their tats, shorts and mohawks, groping one another on a slippery foam-padded floor amidst baying crowds. Did you raise an eyebrow? Because if you did, you’re being very, very childish and we’re all very disappointed in you. There’s nothing amusing about the sight of two sculpted testosterone factories massaging sweat into each other’s calf muscles, nothing the least bit suggestive. This is serious business, son, and you will maintain a respectful attitude. 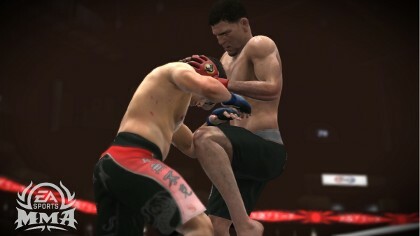 EA Sports MMA (Mixed Martial Arts) takes itself extremely seriously. So seriously that among the factoids you’re presented with as you sift through its many loading screens are definitions for “pain” and “unconsciousness”, just in case you’ve reached the prime of adulthood without experiencing either phenomenon. 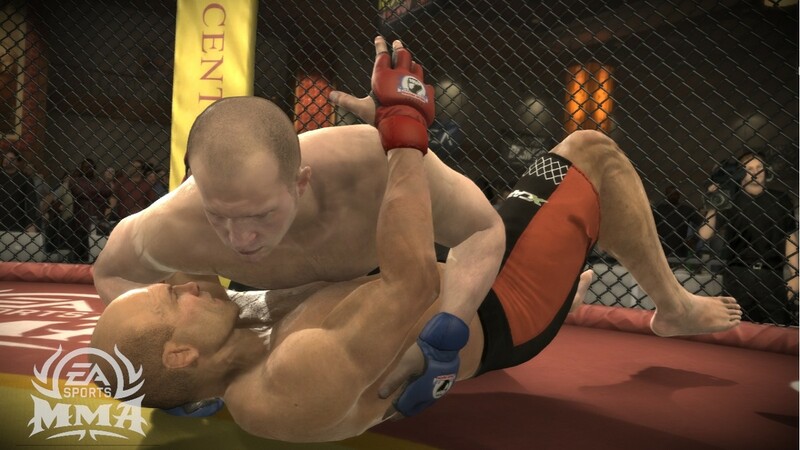 It has a wrathful metally/rappy soundtrack, featuring prominent contributions from Mr Linkin of the Park family, and when you fire up the title menu you find yourself face to face with an in-engine model of Fedor Emelianenko, Russian heavyweight and “greatest MMA fighter of all time”. He glowers as you scan the modes, twitching his gaze towards your selections. Be gentle with me, Fedor. I am but a man. No, I mean I *like you* like you. 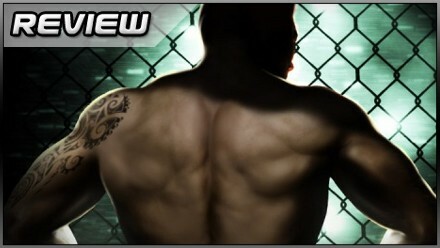 Don’t be too intimidated though, because for all its surly looks and lore mastery, MMA is actually quite accessible. Among the modes writhing in Fedor’s scrutiny is MMA 101, a simple but effective tutorial that walks you through a dud match blow by blow. From there you might leap to Fight Now, pick a weight class, venue, ring type and celebrity flesh mangler, and get yourself repeatedly and entertainingly flattened by the second to bottom-most tier of CPU challenger. Or more sensibly, career mode, where you’ll mock up your own fighter from a pretty comprehensive list of prefabbed options, ranging from fighting style through build to how excitable your character gets when he comes out on top. I named my guy Akira “Maximus” Bowser. He’s a light heavyweight Jack of all trades, half-Scottish and half-Japanese with a cherry-red mullet, and while he has yet to abduct a princess or make off with any Power Stars, I’m sure it’s just a matter of time. The thing that impresses most about EA Sports MMA is the balance. There are three ways you can win a match, basically – hammer somebody’s face or guts in good old-fashioned, stand-up melee, take them to the floor, sit on them and pummel whatever you can reach, or take them to the floor, grab hold of a limb/throat and bend/squeeze/tickle away till they’ve no choice but to tap out. Chiselled into the grain of these general strategies are snippets from a slew of martial art rulebooks, be it the machine-gun kicks of Muay Thai or the enveloping lock-downs of Jujutsu, but despite the variety, no particular style has the edge. Smooth and convincing animations tell you far more about the fine detail of each fight than some abstract set of resource bars. Case study: early on in his career, Bowser found himself in a league dominated by Submissions experts. I duly devoted each set of eight preliminary training sessions to the ground game, improving Bowser’s ability to move around a pinned opponent. A week or two before the first match, the kid broke off regular preparations to visit the legendary Randy Couture in Florida (fun facts: Couture had a role in the Expendables flick and Command & Conquer 3), who taught him a special wrestling hold and put our man to the test with some higher level regimes. When the big day came, Bowser took his opposite number apart, getting a vice-like grip on the man’s trachea in the first 45 seconds. He reprised the performance eight weeks later, and again eight weeks after that, and I started to worry that the combat system was skewed towards ground fighters. Which was cobblers, as it transpired. The fourth league bash, a qualifier for the title fight, put Bowser up against a boxer, and the first thing he did was knee my carrot-topped crossbreed in the kisser as I went for a leg tackle. 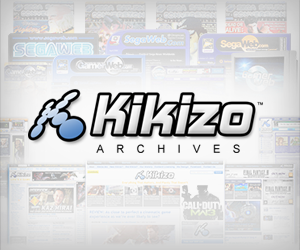 Posted in Reviews, Top 5, and tagged with EA Tiburon, Electronic Arts, simulation, sport.